Before you progress into the story of Dragon Age: Inquisition, you must first craft a main character, or Inquisitor, for yourself. The aesthetics of this are completely up to you, but the class you choose plays a massive role on combat. First-time players will most definitely want to play to their strengths as far as RPGs go, and not choose a class that’s outside their realm of expertise. Before choosing a class, you must first choose a race. Your race will dictate your Inquisitor’s physical attributes, how they are perceived by the rest of the world, and what beginning bonus they receive. Human - The most numerous race of Thedas. Humans are jacks-of-all-trades, and can do well in any class. 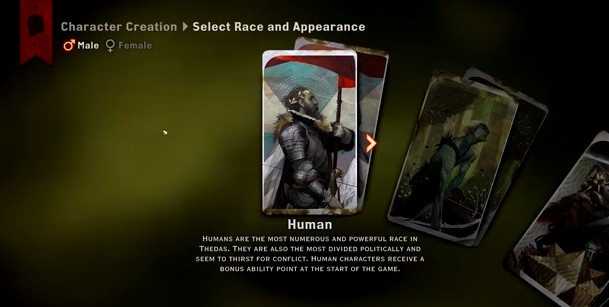 Human Inquisitors receive a bonus Ability Point at the beginning of the game. A good choice for beginners. Elf - The semi-mystical recluses of the world, and often the downtrodden. Elves tend to excel with ranged attacks, and receive a +25% bonus to Ranged Defence. A good choice for Rogues. Dwarf - Staunch underground dwellers who battle the Darkspawn on a daily basis. Dwarves are hardy, powerful characters with a knack for surviving brawls, and do well as Warriors or Rogues of any type. Dwarves cannot be Mages, but to make up for this they receive a +25% bonus to Magic Defence. They make great tanks. Qunari - Stern, powerful warriors with a strict moral and religious code. Qunari are massive frontline fighters that, like Dwarves, thrive in the thick of combat. They’re best used as Warriors. Qunari receive a +10% bonus to Physical Damage Resistance. You do not, of course, have to follow the suggestions above. You can get through Dragon Age: Inquisition with a Qunari Mage as readily as you can with an Elvish Warrior. Just bear in mind to play up the strengths of your class with your race when first playing the game in order to increase your overall survivability. Once you’ve chosen your race you can pick your class. There are three main classes, two of which are broken down into weapon specializations. Rogue - A wise, quiet warrior. Rogues skulk in the back lines of a fight, using ranged weapons or back attacks to inflict most of their damage. Though brittle compared to Warriors, Rogues can dish out a ton of pain if utilized properly. Rogues are also good at a variety of shadier tasks, such as picking locks. Rogues can either be Dual Wielders (two weapons at once) or Archers (bow fighters). Warrior - A rough-and-tumble battler. Warriors are the tanks and melee damage-dealers of your party, and will serve to keep enemies away from the more vulnerable elements of your team. If the Warrior goes down, the rest of your party will be vulnerable. Warriors can be either Two Handed (either uses one massive weapon or one large and one small) or Weapon & Shield (one medium-sized weapon with a shield for greater defence). Mage - A user of arcane arts. Mages remain at the rear of the party, well out of harm’s way, where they can employ powerful spells to demolish large swathes of enemies. A properly-defended Mage will see you through virtually any battle. Mages do not receive any beginning specializations, but the range of spells available to a Mage allow you to customize their efficacy in combat to a greater degree than the other two classes. In addition to beginning a new game of Inquisition, players who are returning to the Dragon Age world can import their decisions from Dragon Age: Origins and Dragon Age II as a collective World State. The World State will be reflected in-game via flavour text, returning characters, different dialogues, and the availability / unavailability of some quests and decisions. World States can’t be directly imported from the previous games, but you can review and edit your decisions via Dragon Age Keep. You’ll need an Origin account to do this. If you do not import a World State, a default World State will be set in place at the beginning of a new game. 1.) Go to Dragon Age Keep and sign in to your Origins account. From here you’ll receive a detailed listing of all the major decisions from the previous games, and how you reacted to each. Some will have an impact on Dragon Age: Inquisition; others will not. 2.) Once you’re happy with your World State, click on the globe icon in the top-right corner of your browser screen. From here, select Import World State. This will ready your current World State for import into your Dragon Age: Inquisition game. Note the time stamp at the bottom of the screen after importing. 3.) Log into Origin via the menu screen. You’ll have to hunt around on the menu for the option to do so, but it’s there. 4.) Create a new character in the game. Just before the end of this process (but before you choose your physical appearance) you’ll receive a prompt to upload your customized World State. Assuming you successfully logged into Origin your World State will pop up. Compare the time stamp that appears with the time stamp on Dragon Age Keep. If they match, you’ve successfully imported your world.